What if I told you that one of North America’s oldest mammals, the southern mountain caribou, the round-hooved arboreal-lichen-eating ungulates who survived ice ages 12,000 years ago, are nearing extinction? Herds that once roamed widely throughout the Columbia Mountains are now isolated into 18 subpopulations, hanging on in the remote areas of our heavily-altered mountain landscapes. Would you act to protect that animal and do everything in your power to recover and protect that species? That’s the question that is currently in the hands of political leaders in Ottawa and Victoria. Mountain caribou have been part of the landscape of British Columbia since the last ice age 12,000 to 14,000 years ago.1 Archaeological records show that caribou followed retreating ice-sheets down the western coastline from the Arctic into southeastern BC at the end of the last ice age and dispersed into new areas.2 Over time, these Arctic caribou, whose ancestors still roam the north in huge herds, adapted to our mountain ecosystems and became the mountain caribou we know today. Deep-snow-dwelling, tree-lichen-eating mountain caribou were once the most common ungulate in the Columbia Mountains, outnumbering deer and historically low populations of elk and moose, who didn’t fare well in the dense forest and harsh winters of the inland temperate rainforest before logging began. They ranged in herds throughout the wetbelt mountain ecosystem in populations of hundreds to thousands throughout the Purcells, Selkirks, Monashees and Cariboo Mountains. 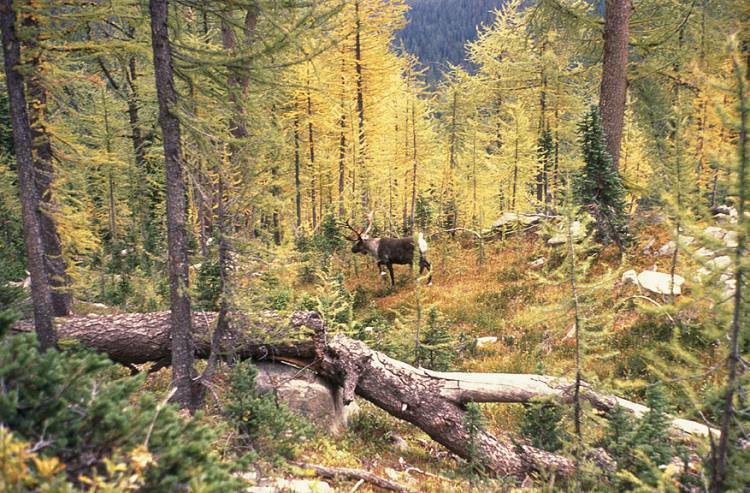 There were also likely smaller isolated herds in wetter forests in the Rocky Mountains, near Fernie, Golden and in the Whitefish Range of Montana. Our unique ecotype of mountain caribou have adapted to thrive in the unique conditions of BC’s inland temperate rainforest where most precipitation falls as snow, and the cool, moist air in old-growth forest canopies provides ideal growing conditions for tree lichens, their main food source in the harsh winter months. If you venture into the quieter parts of the Purcell Mountains, you’ll find that many of the alpine trails in areas like Mallandaine Pass, Perry Creek near Kimberley, or the headwaters of the Spillimacheen are the trampled remnants of the movement of these mountain dwellers. Indigenous peoples relied on caribou for sustenance for millenia. Unfortunately, we don’t know that much about the history of mountain caribou in British Columbia, but there has been some research to understand mountain caribou’s place in our ecosystems of the late 1800s and early 1900s. Bruce McLellan’s research3 based on written accounts from that time, suggests that that there were likely just as many caribou in the South Selkirks in the early 1900s as there were in the Hart Ranges of the Rockies in central BC, where there were 719 caribou in 2006. It is also very likely that there were far more caribou in the northern portions of the Purcell and Selkirk Mountains with populations in the many hundreds or even thousands of caribou. Imagine a landscape of gentle rolling hills pushing up against the big glaciated peaks of the Northern Purcells and Selkirks. Suddenly, tiny specks on distant hills come alive—with small groups of mountain caribou eating fresh vegetation on mountain ridge tops. From 1924 to 1936, this is the scene that National Park Warden Robert Mann reported seeing each October in the Prairie Hills near Quartz Creek, west of Golden, where the hills would come alive with 500–1000 caribou stretched out across kilometers of rolling ridgeline. In areas near Wells Gray Provincial Park and the Northern Cariboo Mountains, it’s likely that there were thousands of caribou in the mountains. Indigenous nations fought battles over the Wells Gray caribou hunting grounds. These caribou battles gave us place names like Battle Mountain and Fight Lake. But after large forest fires in the late 1800s and early 1900s destroyed significant old-growth forests, too much hunting in some areas, and an increase in moose and mule deer populations which brought more wolves and cougars to caribou country, there was a noticeable decline in mountain caribou populations throughout BC between the 1930s and 1970s. One important change was the balance between predators and prey. Before the 1950s, the predator-prey system in the interior temperate rainforest was very different from what it is today: moose and deer were relatively rare, while caribou were abundant. Predators were believed to be in low density in these mountains as moose, elk and deer prefer areas with more forage and less snow. By the 1970s, human impact on caribou habitat was commonplace. Logging pushed deeper into the mountains, harvesting higher elevations and in valleys that were previously inaccessible before mechanization of the industry. Across the landscape, the distribution of forest types in caribou country changed from naturally low levels of young forests (forests aged 1-40 years old) to high proportions of these young forests, growing back after logging, which made these landscapes more suitable habitat for moose, elk, and deer—who moved into the wetbelt region in big numbers. With the elk, moose and deer, came more of their predators, wolves and cougars, who were equally happy to feast on caribou. Today, mountain caribou live only in fragments of their historic range, having likely lost more than 40 percent of their habitat in southeast BC.4 The last caribou population that ranged into the United States, the South Selkirks herd in northern Idaho, is nearly gone with two remaining females. Caribou populations have been fragmented into small isolated herds that rarely exchange DNA. 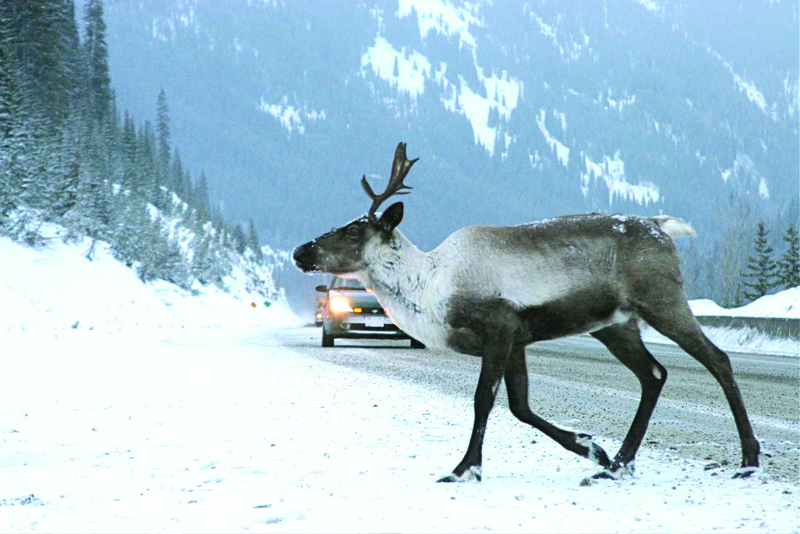 A South Selkirk herd caribou crosses Highway 3 on the Salmo-Creston Pass. Caribou habitat has been badly degraded by logging, resource roads, mines, recreation, hydro dams and increasing forest fires linked to climate change and historical fire suppression. We’ve altered the interior temperate rainforest mountain ecosystem of southern and central BC so much that mountain caribou struggle just to survive in the small patches of somewhat intact mountain landscape that remain. The Saulteau and West Moberly Nations’ efforts in the Klinse-za recovery efforts in central BC offer a glimmer of hope for southern mountain caribou. The Klinse-za herd has nearly doubled in size since recovery efforts began in 2014, with 67 caribou in the herd today. These recovery efforts, including strong habitat protections, restoration of the landscape by closing and rehabilitating roads and speeding up cutblock growth, a maternal pen and a predator control program, are beginning to show that recovery may be possible for mountain caribou herds with comprehensive recovery effort. So what can we do to give mountain caribou a chance in these degraded altered mountain ecosystems? Protecting critical caribou habitat throughout the southern mountain caribou range, from the US border north to central BC, will be essential for the survival of this species on the brink. Much of the crucial mountain-valley-bottom habitat that mountain caribou populations use throughout the year remains unprotected. Rehabilitating disturbed areas by eliminating roads into critical caribou habitat and speeding up growth in young cutblocks must be immediate priorities throughout caribou ranges. While the provincial and federal government agree that much more must be done to stop the declines and begin to recover mountain caribou, so far there’s been a lot more talk than action. A collaborative recovery agreement was announced last fall between the federal and provincial governments, but the agreement has not been finalized and nothing has changed on the ground. Since then, the two southernmost caribou herds have been decimated, leaving two and four caribou per herd, and are on the verge of disappearing entirely. In May, the federal Minister of Environment Catherine McKenna declared an imminent threat to southern mountain caribou under species at risk legislation and highlighted ten southern mountain caribou herds that are facing extirpation. Minister McKenna has an obligation to issue an emergency protection order under the Species At Risk Act if the federal Ministry of Environment believes that the province is not doing enough to protect the species. Despite the obvious urgency, the BC Government’s new proposed Caribou Recovery Program is only a statement of high-level principles and a plan to make a plan—with no real action on the horizon. Logging, road building and other human activities continue to erode caribou habitat. Our mountain ecosystems are changing rapidly from direct human impacts and from climate change. The caribou country that was once home to thousands of southern mountain caribou may never see that sort of abundance again, at least for thousands of years. But shouldn’t we do everything in our power to give caribou a fighting chance? 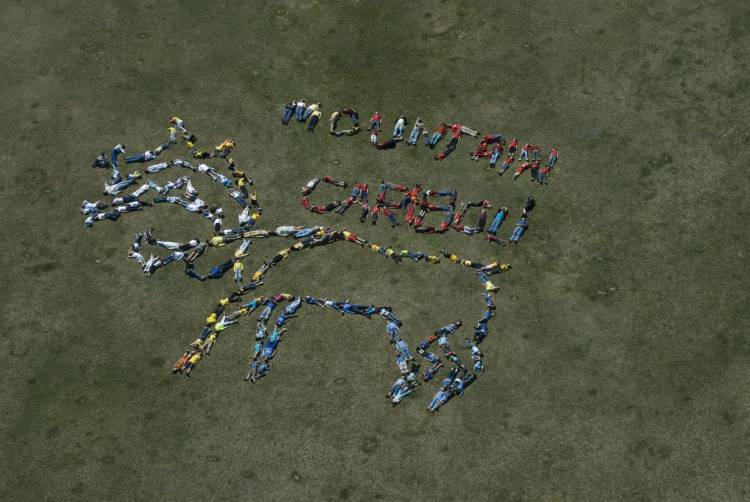 Students from Lindsay Park Elementary in Kimberley care about the future of mountain caribou. Photo: Pat Bates. Header image by David Moskowitz. Spalding, D.J. 2000. The early history of woodland caribou (Rangifer tarandus caribou) in British Columbia. Wildlife Bulletin No. B-100. Ministry of Environment, Lands and Parks, Victoria, British Columbia. Harding, Lee. 2003. Distribution of caribou in North America. Proceedings From The Caribou And Relationships Workshop. Keri McFarlane, Anne Gunn, and Curtis Strobeck (Editors). Department of Natural Resources and Environment Government of the Northwest Territories. McLellan, Bruce. 2010. An Historic Perspective of Mountain Caribou Distribution and Abundance. British Columbia Ministry of Forests, Research Branch. Environment Canada. 2014. Recovery Strategy for the Woodland Caribou, Southern Mountain population (Rangifer tarandus caribou) in Canada. Species at Risk Act Recovery Strategy Series. Environment Canada, Ottawa. viii + 103 pp.